Clean eating is the ultimate non-diet for weight loss, and these clean eating snacks are your gateway to healthier eating habits and a slimmer body. To help kickstart your health journey by eating clean snacks, these healthier snack foods and recipes take either no prep time, or only 5 minutes of hands-on prep time, and are easy to take on the go. What Are Clean Eating Snacks? Clean eating is NOT a fad diet. It’s about eating real food that is naturally nutritious and tasty. Real whole foods provide a boost of consistent energy without the sugar crash. Clean eating is a wholesome, consistent and sustainable way to eat to optimize our body and our health in the long term. Processed foods are a major contributor to our current obesity epidemic, especially processed sugars. While it’s difficult to completely avoid store-bought snacks, it is possible to find packaged healthy clean snacks. Look for clean eating snacks from the supermarket by paying attention to ingredient labels and avoid ones where the ingredients appear unnatural or not easily readable. This healthy clean snacks list is divided into 2 categories for your convenience: easy clean eating store bought snacks that are mostly single ingredients and requires no prep time, and snacks with simple recipes that you can make ahead. 1. Almonds – high in healthy fats, fiber, and protein, almonds can keep you feeling full and help reduce belly fat. Just don’t eat too much in one shot. 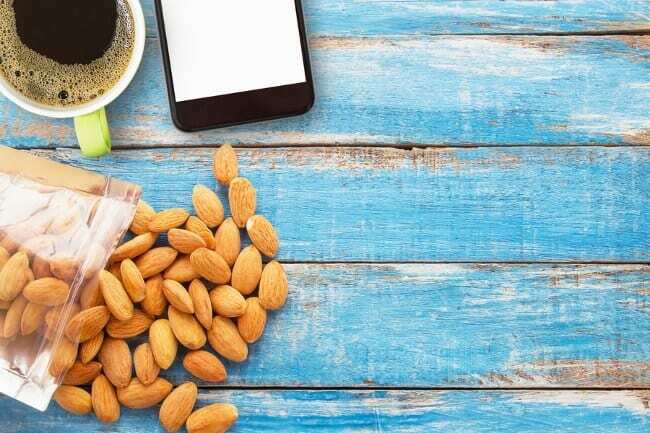 These 1.5-ounce pre-portioned almond packs are just slightly salted and perfect to take on the go! 2. Pomegranate Seeds – rich in vitamin C, potassium and fiber, they make a refreshingly juicy and crunchy snack! 3. Oranges – eating the whole fruit instead of just drinking its juice ensures that you get the fibers to cleanse your body and keep you feeling full. 4. 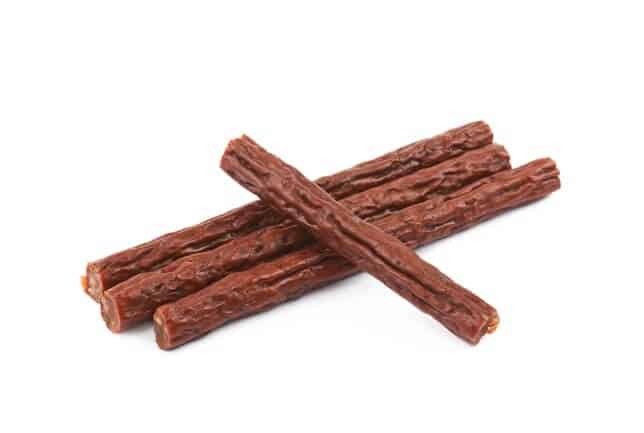 Clean Jerky – a delicious, high protein snack that can kick hunger to the curb! This free-range turkey jerky is free of nitrates, added antibiotics, and added sugar. It’s also made with fat burning spices that boost your metabolism. 5. Avocado – high in fiber and healthy fat, avocado is an easy clean snack on its own or sprinkled with lime juice, salt, and black pepper. 6. Pumpkin Seeds – these small seeds are packed full of nutrients including healthy fats, magnesium, and zinc. 7. Mixed Nuts – nuts are highly nutritious and I consider them to be one of the best clean eating snacks with protein and healthy fat. While they have calories, their fiber help reduce your appetite. Just watch the salt content and use these stylish non-toxic reusable snack bags to prevent overindulging and get inspired to prep healthy, portion-controlled snacks. 8. Bone Broth – the most nourishing food for your gut and overall health. You can purchase bone broth powders and simply add hot water, or prepare your own homemade bone broth for weight loss. 9. Cottage cheese and berries – cottage cheese is subtly sweet, high in protein and low in fat, making it a popular food for weight loss and muscle building. Its sodium content is high, so consume in moderation. 10. Apple and Peanut Butter – a savory combination. Just be sure to check the peanut butter ingredient label for any questionable ingredients other than peanuts, and only consume a maximum of 2 tablespoons per day. 11. Celery and Almond Butter – another delicious healthy snack combination. Celery is a zero calorie food, and the almond butter makes this clean snack more filling. The same limit of 2 tablespoons per day applies here as well. 12. Grapes and cheese – the alternative to wine and cheese before happy hour! 13. 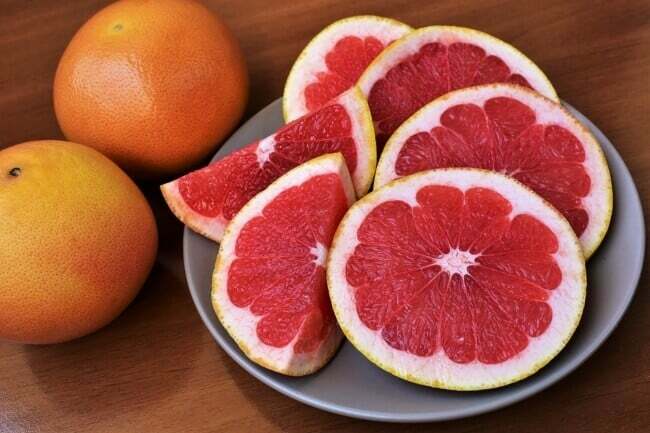 Fresh Grapefruits – a large, fibrous fruit snack that can curb your hunger so you consume fewer calories. 18. 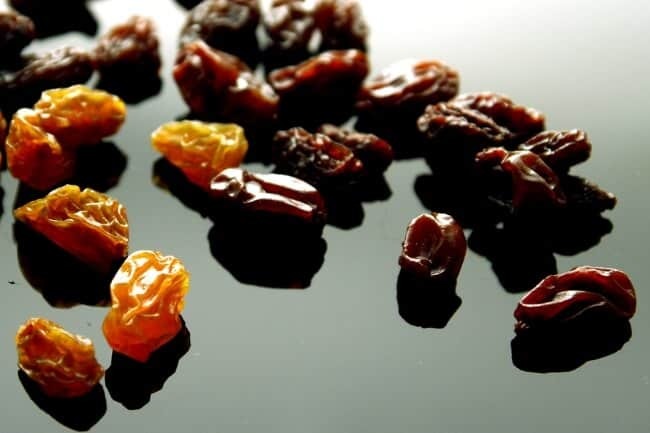 Unsweetened raisins – despite their small size, raisins are packed with vitamins, minerals, and fiber. They are naturally sweet and high in sugar but are highly beneficial to our health when eaten in moderation. These mini-box raisin packs are a favorite for my little ones, and they make a healthy treat for Halloween or holiday gift baskets. 19. Edamame – an excellent source of iron, calcium, and protein. You can buy them fresh or frozen, shelled or in a pod. 20. Hummus – high in fiber, antioxidants, and protein, hummus is healthy if eaten in moderation. You can usually find a store-made, clean version of this healthy snack in supermarkets if you don’t have time to make this at home. 21. Guacamole – nutritious and full of healthy fat, guacamole curbs appetite and most supermarkets have their own store-made clean guacamole. 22. Green Smoothies – the ultimate clean eating snack for weight loss and health! Green smoothies are also easy to prep for a snack or breakfast on the go! 23. Chia Puddings – chia seeds are a good source of omega-3 fatty acids, fiber, iron, and calcium. They can be added to green smoothies or soaked into puddings such as this delightful Mint Chocolate Chia Pudding. 25. Clean Energy Bites – easy to make and no baking required, try this 4-Ingredient Peanut Butter Energy Bites. 26. 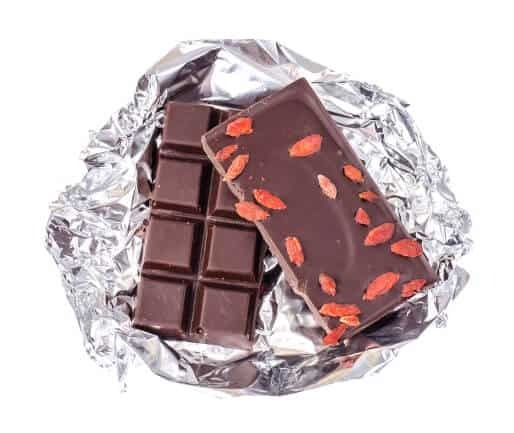 Goji Berries and Dark Chocolate – goji berries are a superfood that contains all essential amino acids, but eating these small berries alone can hardly satisfy hunger. Combining goji berries with dark chocolate brings together subtle sweetness and bitterness for a perfect afternoon pick-me-up. 27. Plain Yogurt and Berries – while fruit-flavored yogurts are convenient, they have a high amount of added sugar. Make your own clean yogurt by adding your own fruits and sweeten with raw honey or maple syrup. 28. Overnight Oats – takes only 5 minutes to mix the ingredients in batch and portion into grab-to-go mason jars. Try this easy and delicious Skinny Peanut Butter Overnight Oats. 30. Cacao Nibs – add these to nuts for a trail mix or sprinkle them on top of plain yogurt with strawberries or raspberries and honey. 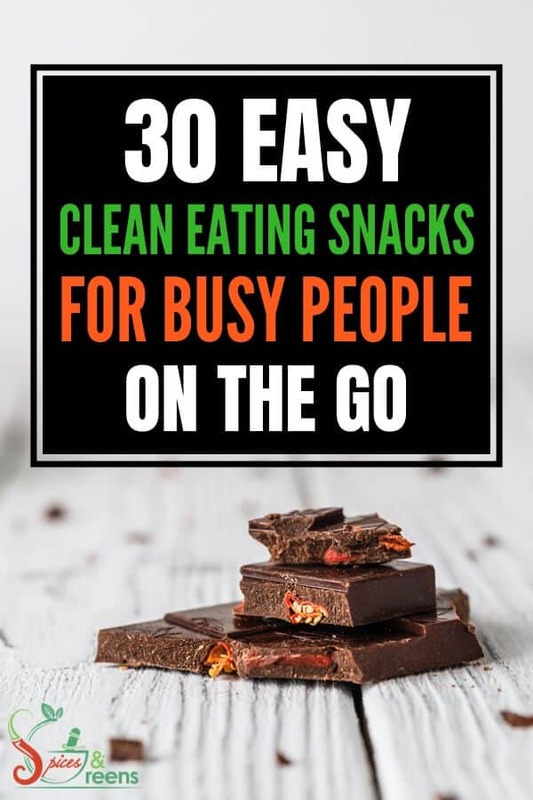 There you go, a total of 30 easy clean eating healthy snacks for you that are busy on the go! 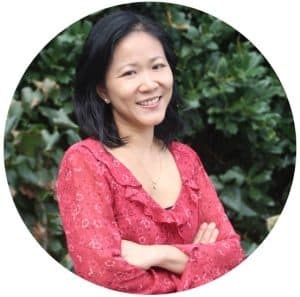 If you are looking for more snacks and meal recipes to eat clean and to lose weight, check out my 21-Day Slim Down Challenge FREE Training to learn more about the fat burning spices and healthy greens that helped me to lose 10 pounds in a month without working out or starving myself! Sharing is caring! What are your favorite clean eating snacks and recipes? Comment below!